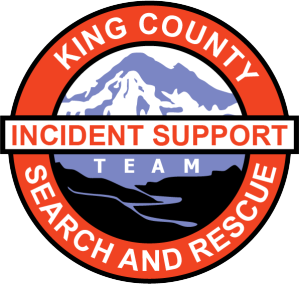 The King County Incident Support Team (IST) is a non-profit organization that provides support services to the King County Sheriff’s Office and other units of the King County Search and Rescue Association assisting individuals requiring search and rescue services. IST provides Incident Command System expertise for incident management, planning, logistics, administration, and communications at search and rescue missions and large scale special events in King County, Washington. Because our training is of an all-hazards nature, we maintain capability to support other types of incidents if deployed. Comprised entirely of highly trained volunteers, we respond to over 70 missions per year under the direction of the King County Sheriff’s Office. We are funded entirely by volunteer donations.